Rich, tender yet not too sweet Double Chocolate Devil’s Food Cupcakes with Vanilla Bean Buttercream decorated two ways. A chocolate lovers dream. I turned 45 this week. As I contemplate what this means, I tell myself it’s just a number. A system to keep track of time passing and the past. A way to schedule, keep appointments, quantify how long to boil that egg, and rates of change. What I’m thinking about more than the number itself, perhaps, is a vivid recollection of my 40th birthday party, just five years ago. It was a big year. The year I made the decision to leave my career. I threw a party to celebrate it and my 40th. I blinked and I’m 45. My cousin, who shares the same age and birth month reminded me this week that in five more years, we’ll be 50. For comparison’s sake, another blink. Because of this, I’ve been thinking more about how I spend my time, my days…. my years. What I want, where I’m heading. Contemplating short- and long-term goals. Thinking about those things I’ve been wanting to do yet haven’t. Maybe I’m thinking too much? Above all, I’m grateful for where I’m at in life. I’m healthy, save a pesky hypothyroid; safe; wiser; spending this journey with the love of my life, and am doing the work I love every day, still growing spiritually and emotionally and able to invest in those pursuits. Life is so sweet. Can we all agree, the older we get, the faster passage of time feels? I think it’s because there’s more we want to accomplish, so the days are fuller and there never seems to be enough time to do what we want. I’ve reduced the number of bullet points on my daily calendar in an effort to be mindful and combat feelings of overwhelm and of not accomplishing enough in a given day. I’m just realizing that I define what enough is. It took me 45 years to figure it out. But, during this pause for reflection, I also remind myself to slow down, take time for special moments and for pursuits of passion. Even if that special moment is to stop and watch a bee buzz into a flower to collect pollen, laugh with my mom, or to spend extra time with a friend, solving the world’s problems. Contributing to community is also an area I want to spend more time. For me, that pursuit of passion comes in the form of assisting in environmental problem-solving, action and activism. I’ve talked about this before, contemplating life and my mind is generally chatty in regards to these things. With the passing of another year, I’m reminded that although time is relative, it moves at a sharp clip. Slow down, breathe… look up. Baking slows me down. Because cakes are for special occasions, especially birthdays, it was time. Whether it’s a beloved layer cake or cupcake, special times call for special things. And while scratch-cakes do take some time, attention, and planning, they’re always worth the effort, not only for the maker, but for the recipient and everyone who shares in the celebration. These aren’t over-the-top sweet cupcakes. The cake, related to a genoise, an Italian sponge cake, relies on eggs whipped to ribbon stage, creating a light-as-air, pillow-soft cake. European pastry is known for its marked less sweet approach when it comes to baked goods. It’s because of this approach that the double chocolate, coffee and vanilla bean notes shine in this recipe. After the eggs are whipped to ribbon stage, a chocolately mixture of cocoa powder, espresso, sour cream, and coconut oil are gently mixed in. Then a flour and brown sugar mixture is slowly added into the thick, airy batter. Just before scooping the dreamy batter into the baking cups, chopped dark chocolate chips are folded in. Can you taste the chocolate heaven? Swiss meringue buttercream is another reason these cupcakes are not over-the-top sweet. Cooked then whipped egg whites and sugar create a meringue. After the meringue is whipped to room temperature, butter is added, a little at a time, to create a silky smooth, creamy, fluffy icing ideal for crowning and decorating these double chocolatey cakes. If you’re looking for an over the top chocolatey and sweet cupcake, I’ve got you covered with these Perfect Chocolate Espresso Cupcakes. For a dairy and egg-free chocolate cake, check out my Vegan Chocolate Hazelnut Cake with Whipped Ganache. 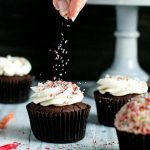 Double Chocolate Devil’s Food Cupcakes with Vanilla Bean Buttercream take a bit of attention to detail, but they are fun to make and may just stretch your baking skills. Don’t let the methods deter your desire to make from-scratch cakes. Really. They’re not as scary as they seem. While I don’t normally use artificial food colors, I couldn’t help myself with the sprinkles. They are so fun, colorful and festive, so I went for it. I figure it would be okay for a special occasion. Plus the crunch factor (!!). My inner child was tugging at me. How do you feel about time with regards to birthdays? How do you feel about making from-scratch cake? Please share below! I’d love to know your thoughts! A rich yet light chocolate cupcake with a bit of espresso, studded with dark chocolate chunks and topped with vanilla bean Swiss meringue buttercream icing. This is not an overly sweet cupcake, rather just enough to engage your sweet tooth while quelling your chocolate cravings. 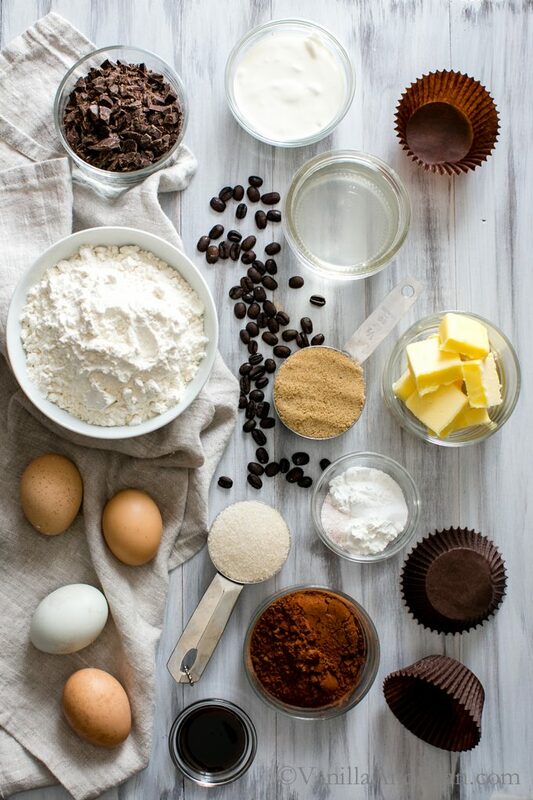 *Prep time above does not include amount of time to decorate cupcakes. 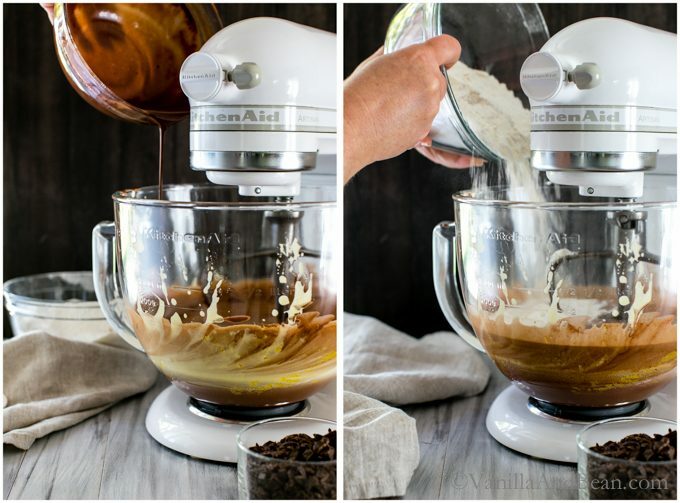 A stand mixer is quite helpful to have when making this recipe, although it can be made with a hand held mixer. Set up a bain marie: The bain marie should be large enough to hold the mixing bowl you'll be mixing the cake in. Fill a sauce pot with water and heat until just steaming, not boiling. Test to make sure your mixing bowl can set in the water without the water splashing out while you gently stir the mixture. You'll need the bain marie for both the cake mixture and the buttercream. Place baking rack in the center of the oven. Preheat oven to 350F (180C) and line cupcake pans with 16 muffin cups. In a small mixing bowl, add the cocoa powder, hot espresso and vanilla extract. Whisk until incorporated. Whisk in the sour cream first then add the coconut oil. 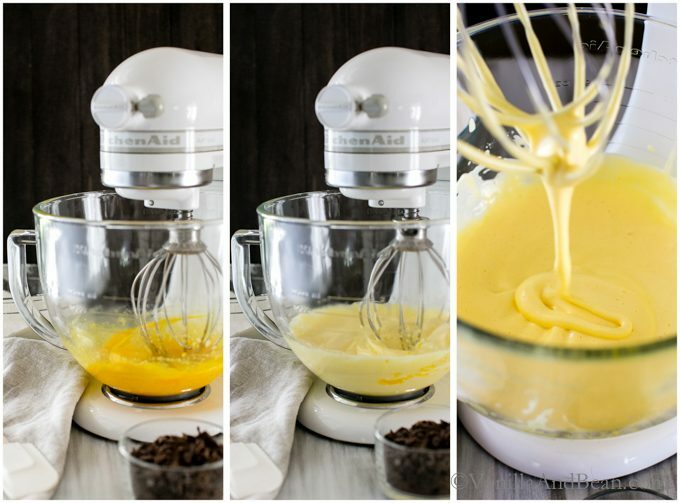 Whisk to a smooth and incorporated consistency. Set aside. In a large mixing bowl, sift the flour, corn starch, sea salt, baking powder, baking soda and light brown sugar. Whisk. Set aside. In the mixing bowl of a stand mixer add the eggs and sugar. Set on the bain marie. The bottom of the bowl should touch the water. The water should be steaming, not boiling. Whisk the mixture while it warms to room temperature. Test the temperature with your finger. It should not be hot, but just comfortable. Dry the bottom of the bowl, turn off the burner and place the bowl on the stand mixer. Using the whisk attachment, whip on medium-high (speed 6 or 7) for about five minutes. The eggs will become lighter in color and airy, doubling in volume. Whip to ribbon stage. Test this by removing the whisk, dipping it in the eggs and drizzling the eggs into the bowl. If the eggs disappear into the bowl, then keep whipping. If the drizzle floats on top of the eggs forming a 'ribbon', the eggs are ready. This should take about 5-6 minutes. Scrape down the bowl. Remove the whisk attachment and attach the paddle. With the machine running on low, pour in the chocolate/oil mixture, slowly. Stop 1/2 way through adding the mixture and scrape down the bowl. After adding all the chocolate/oil mixture, mix in the flour mixture on the lowest setting, in two batches, stopping to scrape the bowl once. Do not over mix here. Mix just until the last bit of flour is incorporated. Remove bowl from stand mixer and fold in, very gently, the chopped chocolate. The batter will be light and airy. 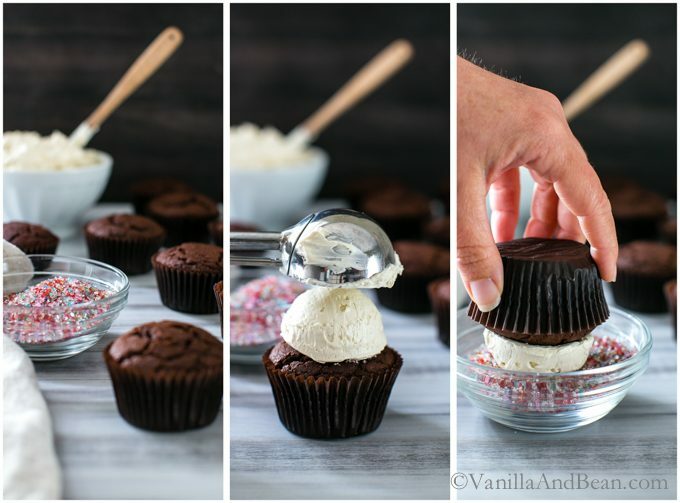 Use a #20 cookie scoop to make portioning the cupcakes a snap (or fill each cup to 3/4 full). Bake for 20-22 minutes. A toothpick should come out clean when cupcakes are done. Be sure to not open the oven door until 20 minutes as we don't want the cupcakes to deflate! 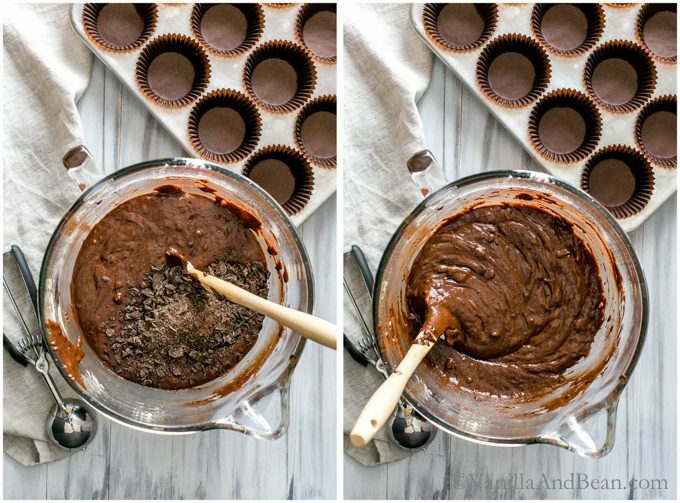 Cool in pans on a cooling rack for 10 minutes, then remove from pans and allow to fully cool to room temperature before assembling the cupcakes. In a small sauce pot add the sugar and water. Bring to a boil and cook until the sugar is dissolved. Pour into a lidded container and stir in the Kahlua (optional). Store in the refrigerator until ready to use. Warm the water in the bain marie. Top off the water if needed. Heat to steaming, not boiling. Make sure the stand mixer mixing bowl can fit in the bain marie, touching the water. Have a thermometer on the ready. In the stand mixer mixing bowl, add the egg whites, sugar and salt. Set the bowl into the bain marie, making sure the water is not boiling and the water is touching the bottom of the bowl. Whisk the egg mixture, occassionally, while heating to 160F (71C). This should take about 8-10 minutes. The mixture will become frothy and fluffy. Wipe the bottom of the bowl dry and place it on the stand mixer. Using the whisk attachment, whip the eggs on medium-high (speed 6-7) for about 5 minutes. The mixture will become sticky, shiny white and have cooled to room temperature (the bowl will remain hot to the touch, so to test for room temperature, touch the mixture). You've now made Swiss meringue. Now we'll add the butter to make the butter cream. With the mixer on medium-high (speed 6), add the room temperature butter, one Tbs at a time adding more only once the previous butter has fully incorporated into the mixture. Keep adding butter until all the butter has been added. Turn the mixer up to high, speed 7 and mix until light and fluffy. This should only be about a minute or two more. The buttercream is ready to use. Make sure the cupcakes are completely cool before icing. Using a skewer or toothpick, poke 5-10 holes in the top of the cupcake making sure the holes are very close to the edges of the cupcake. Brush on the simple syrup being careful not to add so much that it overflows onto the paper cups. 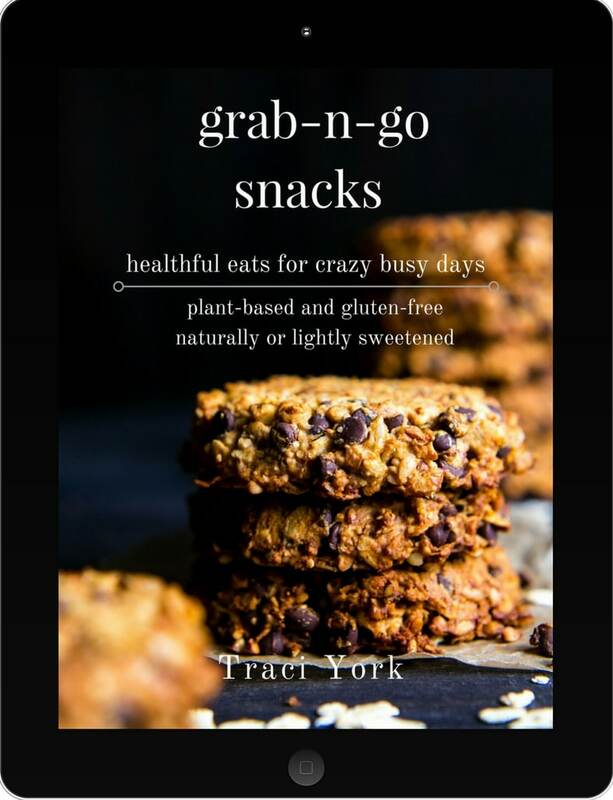 It will be a sticky mess when trying to eat them. There's enough icing to pipe/spread/scoop about 2.5 Tbs of icing on each cupcake. Fit a piping bag with your favorite tip and pipe the cupcakes. Or use a large cookie scoop, 2-3 Tbs, to place a scoop on top of the cupcake. 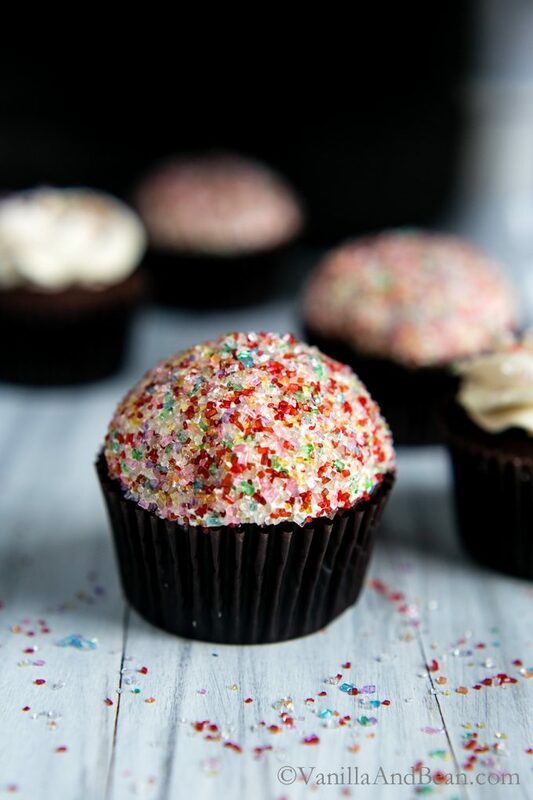 Invert the cupcake into sprinkles and roll the icing into the sprinkles, gently pressing to shape the dome. Store the cupcakes in a lidded storage container for up to two days. But their at their best on the day baked. Cupcakes can be made in advance. Simply freeze in a freezer bag when completely cool, making sure to press out as much air as possible in the bag. Freeze for no more than a week. If storing the buttercream before using, store it in a lidded container at room temperature. 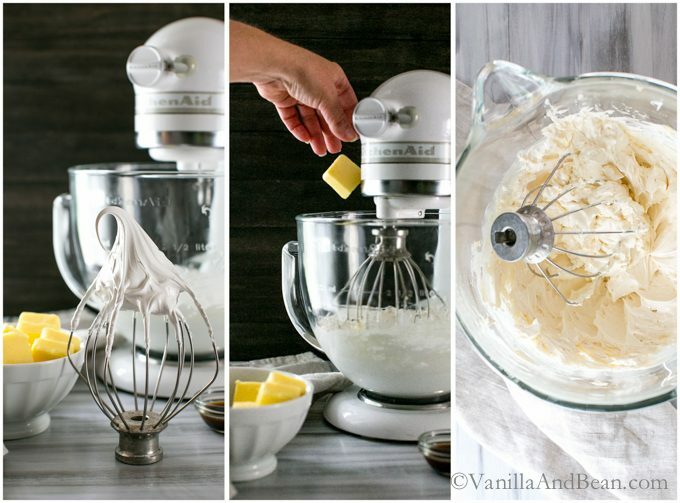 To rewhip the buttercream simply use a hand whisk or rewhip it on a stand mixer. If it feels stiff, place the buttercream in a heatproof bowl and dip it in a bain marie to gently warm the buttercream. Do not allow it to melt, rather, just warm the bottom of the bowl, then whisk. Great recipe! I definitely want to try out that buttercream! Oh yeah, it’s quite simple to make as long as you pay attention to the temperature of the ingredients along the way. It is soooo silky! I hope you enjoy it Sabrina! Happy Birthday, Traci!! 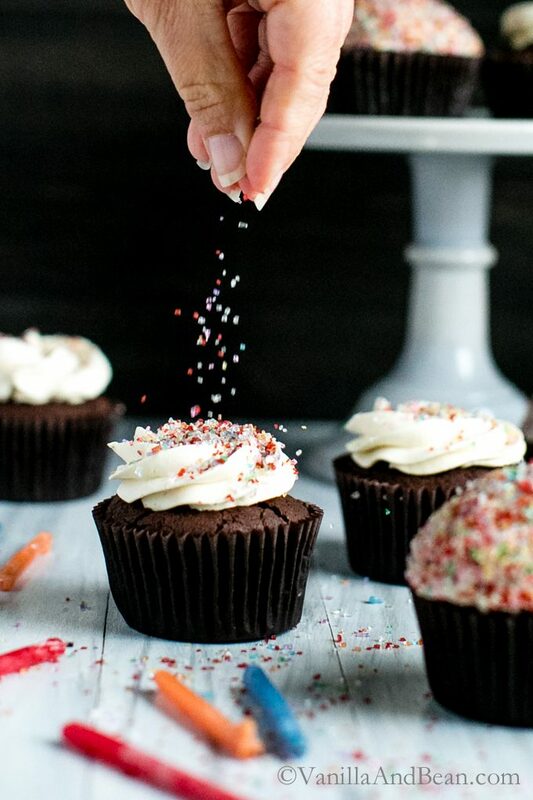 These cupcakes feel like the perfect celebration – and the sprinkles on top of the mound of buttercream looks so stylish and fancy. I couldn’t agree with you more – the older I get, the fast time seems to pass. I think you’re completely spot on – there’s so much more i want to accomplish each and every day (and more I keep putting on my platter…new house…baby…work…sheesh) – it’s helpful to remember to slow down do exactly what you can do and not feel one ounce of guilt about it. Hope you had a wonderful celebration! First of all – Happy Birthday! I know just what you mean about time going by in a blink. It just keeps going faster. I love that you are staying present and living intentionally. Something I am working on too! These cupcakes are just so beautiful, and are everything I think a cupcake should be! The perfect thing for your birthday! Pinning! I hope your birthday was as wonderful as you are, Traci! This was such a thoughtful and beautifully written post, and of course these cupcakes are gorgeous. I also love the beautiful sprinkles you chose to adorn them with. 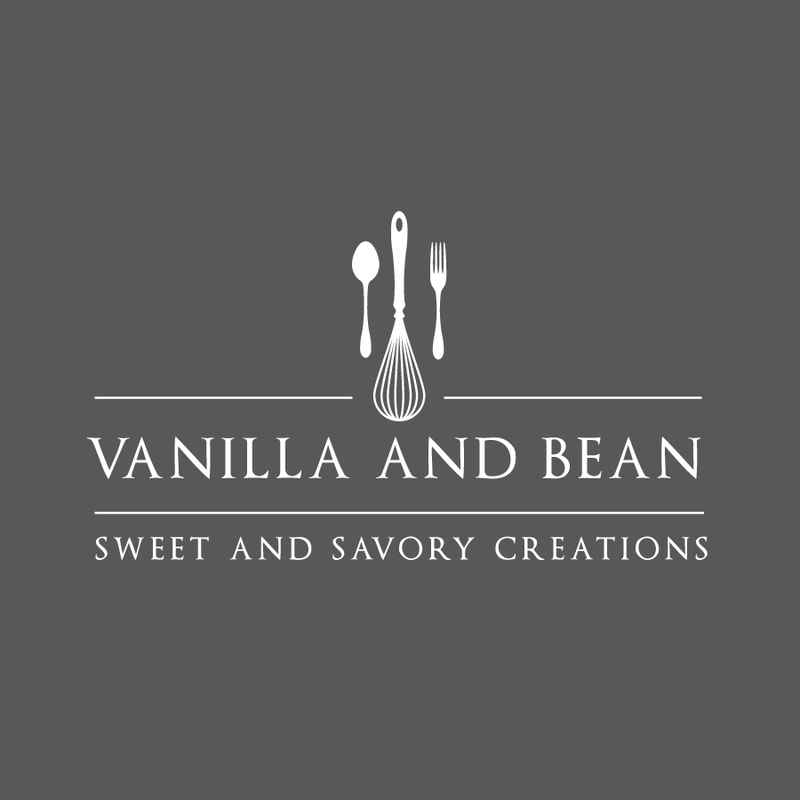 The vanilla bean buttercream sounds so sensational! Happy Birthday, Traci! I am with you, time just keeps flying by faster and faster with each year. I need to remind myself to slow down and enjoy it, I am so guilty of rushing through and being ‘busy’ all the time. Lovely looking cupcakes, and absolutely STUNNING photos! I hope you had a wonderful birthday, Traci! I always think of A Tree Grows in Brooklyn with how time passes more quickly as we get older, because I read it first when I was so young and didn’t understand how time really can fly. You are doing wonderful things, though, and using that time so well! These cupcakes are beautiful (and so are your nails)! P.S. I made a version of your lemon and raspberry dutch baby this morning and it was excellent! These are just amazing looking and I bet they tasted so good! I am seriously impressed with your mad photo skills. Love this! Hope you had a great birthday and here’s to many more healthy happy and beautiful birthdays! The cupcakes look amazing! Happy (belated) birthday, Traci! Woo hoo! 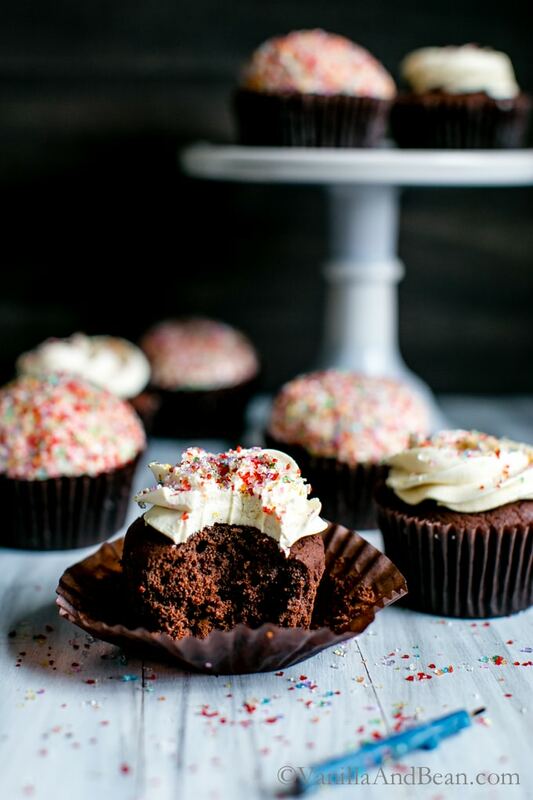 These cupcakes are just a fabulous way to celebrate. And yes, too much thinking and a to=do list that is too long pretty much perfectly sums up my life thus far. We definitely need to stop and smell the roses, so to speak. Or maybe stop to smell the baking cupcakes. Hope you had a fabulous weekend! XOXO! Aw yay! Happy Birthday, dear Traci! I loved this post. I share so many of the same sentiments about getting older, dreaming, following passions, and SLOWING DOWN. Such lovely, fun, and festive little cakes here and I adore those sprinkles. At 45, you are still so much fun! Oh, Happy Birthday Gorgeous! Wish we could be clinking glasses together in the sunshine enjoying some ruckus laughter and a couple of these delicious double chocolate cupcakes of yours! I swear I can taste them from here (that buttercream frosting…). Do I feel the exponential passage of time? My boys had the nerve to morph into men without my consent and I’m pretty sure I just gave birth to them yesterday :0. Leading a well and fulfilled life at 45 is certainly something to celebrate ~ cheers to the years lady, may your blessings continue to be many, x. Happy (belated) Birthday, Traci! I hope it was every bit as beautiful as this post! Also, I completely agree with what you said about time passing too quickly. The busier I am the more I notice this and it reminds me that I need to slow down. It’s just so hard to do when you’re working to grow something. But I suppose it’s better to grow at a slower rate and still enjoy life than it is to let it pass you by. Thank you for the wisdom and for these beautiful cupcakes! I wish I had one right now. They look like the perfect way to celebrate! Traci, happy belated birthday!! Time does pass by so quickly! It’s funny because just earlier this week, I was thinking about where I was in life in 2010. I had just come back from China, ready to start 3 of my most challenging years in life: law school. In a very unexpected way, I decided to pursue a career in food over the last few years. I completely understand how you feel about switching courses in life, and I’m glad that our paths crossed through our blogs. Cheers to many more years of food, sprinkles, and delicious chocolate cupcakes! P.S. I think it’s adorable that your mother commented on this post! PS – yeah, I know, right? I think this is the second time, hehe! I’m always here for less-sweet pastries. This one looks like a beautiful way to celebrate a birthday. Five years ago the profession lost an amazing teacher. The world gained more attention from a giving soul unfettered by the frustrations of modern public education. Happy Birthday; I’m looking forward to our walk and lunch party. I would likely give up an internal organ for one of those cupcakes. Can we bake sometime, please? Absolutely beautiful post! I couldn’t agree more with your sentiments! I feel the passing of time even more as I watch my sweet babies grow up…way too fast! Happy birthday Traci! Your post really resonated with me because I’ve been thinking a lot about how I spend my time lately. Sometimes I feel like I’m not making the most of it, you know? And with time flying by so quickly lately (how am I turning 27 next week?!) I would hate to realize I’m wasting it! It’s something I need to do some thinking on for sure. Well Happy Birthday Traci! 45? I’ve got you beat my friend! Never thought I’d lie about my age, but I’m seriously contemplating it! Ha! I keep telling myself, “you’re only as old as you feel! !” These cupcakes are stunning as usual Traci! Pinning these for a summer party! And that comment from Mom! How wonderful! The biggest of hugs on your birthday, Traci!! I loved reading this post because it was full of so much wisdom and insight – I still don’t feel like I’ve figured out what doing “enough” is for me, yet. I hope it will come with the passage of time, as it has for you. Happy Birthday! This cake is gorgeous. My mom had the realization that she’ll be 50 in two years recently, too, and she was stunned. But I think my mother is so young at heart and honestly, to me, she hasn’t aged at all (but that’s probably because she’ll always just be my mom ;) ) Time definitely does pass faster as you get older! Your blog, your photography, and especially you are magical. I love reading about your journey as much as I’ve loved being a part of it. A hand painted sign should read, “Eat the sprinkles” in your honor. I used to be afraid of getting older. Not anymore.. Because as I am getting older I am realizing that I am also getting wiser and more confident. Confidence in yourself is an amazing thing. Something that you just don’t have when you are young. Knowing myself and my boundaries in life came with age and I wouldn’t trade it in for anything. You words about 45 are magical. I still have 7 years to get there, but I love the look and sound of where you are in life right now. Gorgeous???? Happy, Happy Birthday, dearest Traci! Traci, I can’t get over these photos! 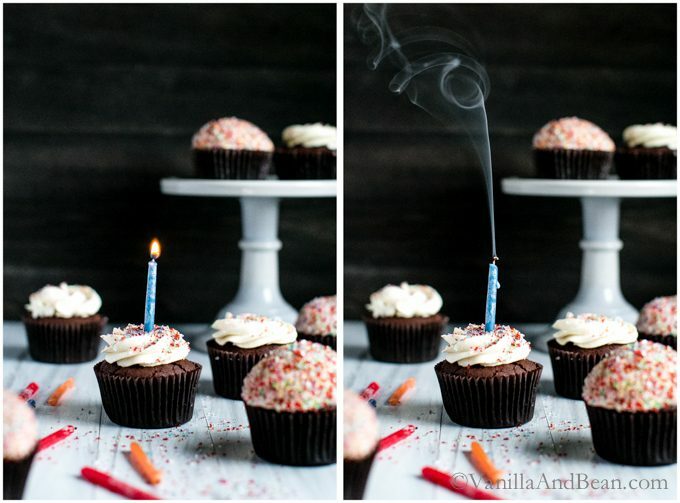 The sprinkles falling, the candle smoke, the frosting— you’ve really outdone yourself!! STUNNING! I can definitely relate with the passage of time. I have a birthday coming up in a few short weeks and it also happens to mark 5 years since I’ve graduated from college. 5 YEARS! It certainly does not feel like it’s been 5 years! Thanks for the beautiful recipe and post, as always !